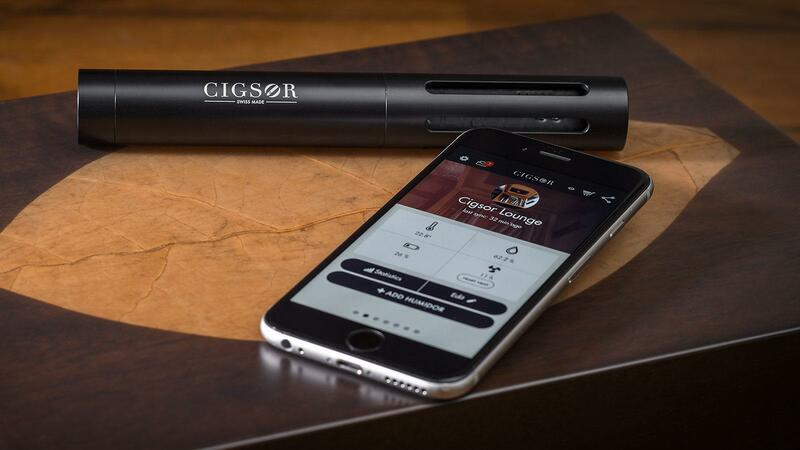 The Cigsor is a cylinder-shaped sensor that allows cigar smokers to monitor the conditions of their humidors via a smartphone. You would be hard pressed to find a group of people who respect old-world craftsmanship more than the premium cigar community, but that doesn’t mean we are impervious to the influences of modern technology. This is especially true in the humidor, where wireless monitoring and control devices have become increasingly popular in recent years. One such product is the Cigsor, a Swiss-made sensor that allows cigar smokers to monitor the conditions of their humidors via a smartphone. The main draw of the Cigsor, compared to similar products on the market, is the way it uses WiFi to transmit data from your humidor to a cloud that can be accessed on your smartphone at any time. The Cigsor is a heavy cylinder that resembles the shape of a fat, large cigar. It measures 7-inches long and is about an inch in diameter. To install the device, you’ll first need to download the Cigsor app, which is available on both iOS and Android devices. After synching the device with your smartphone, you can set desired humidity and temperatures ranges, as well as alert settings. If the conditions of the humidor fall outside of its set range, the Cigsor will notify you via a push notification or email. The Cigsor automatically updates the humidor reading every hour, but humidity and temperature levels cannot be checked in real time. The device, however, does store the data within the app, so you can look at the history of your humidor conditions sorted by day, week or month. The app will also prompt users to set a ventilation reminder, and the Cigsor will alert you when it’s time to let some fresh air into the humidor. The Cigsor comes pre-calibrated, and will begin working almost immediately after it is installed in your humidor. Cigar Aficionado tested the Cigsor readings against additional hydrometers and found the humidity and temperature gauges to be quite accurate. 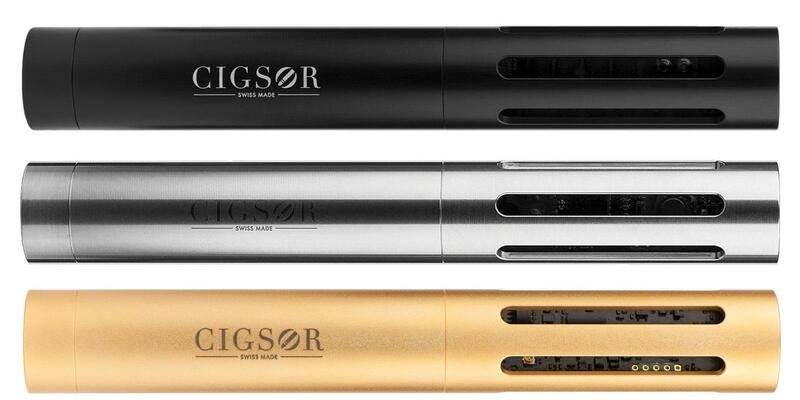 The Cigsor comes in three different designs, from top: Classic, made from anodised aluminum; Premium, made from stainless steel; and Luxury, which is plated in 18 karat gold. 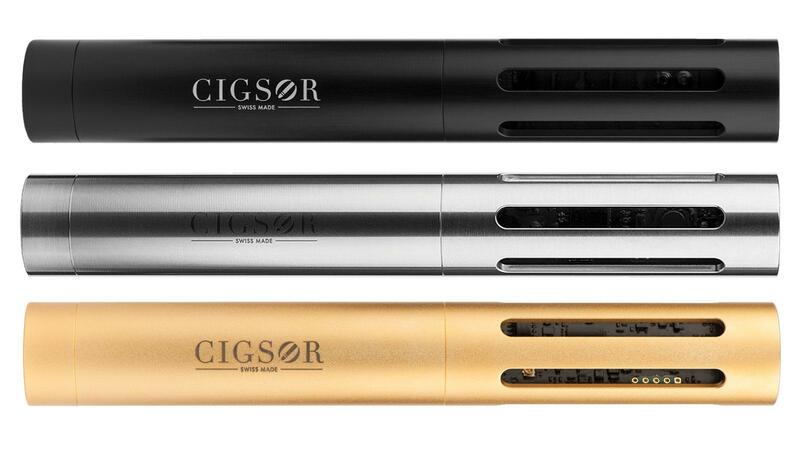 The Cigsor comes in three varieties: Classic, made from anodised aluminum (184.77 Swiss Francs, or $185.18); Premium, made from stainless steel (314.76 Swiss Francs, or $315.45); and Luxury, which is plated in 18 karat gold (834.73 Swiss Francs, or $834.73). The downside of the Cigsor device is its size, which is quite large and, given its shape, difficult to mount on the lid of the humidor. This means it will have to take the space of a cigar or two, which could be a problem if you have a smaller humidor. The Cigsor also might not be the best humidor sensor for every cigar smoker. Those who would forgo the WiFi connection for a smaller and more affordable product may favor the Boveda Smart Sensor, which uses Bluetooth to offer real-time reads and alerts within 100 feet—for only $40. And if you’re interested in a device that allows you to not only monitor the conditions of your humidor from a mobile device, but also adjust the humidity and temperature, there is also The Smart Humidor from Cigar Oasis. The Cigsor, however, is a fine product with accurate, all-encompassing features. Whether you’re a frequent traveler with a large collection of cigars or a brick-and-mortar shop owner looking for around-the-clock readings of your walk-in humidor, consider this product for dependable humidor monitoring from anywhere in the world.